The Great Steak Debate: To Charge Or Not To Charge? Carnival announced today that it’s charging extra for premium steak and lobster entrees in the main dining room. The extra $20 fee is sure to rile up rabid cruisers. Is this a good thing for the consumer or a sign of a gastro apocalypse for the average vacationer? 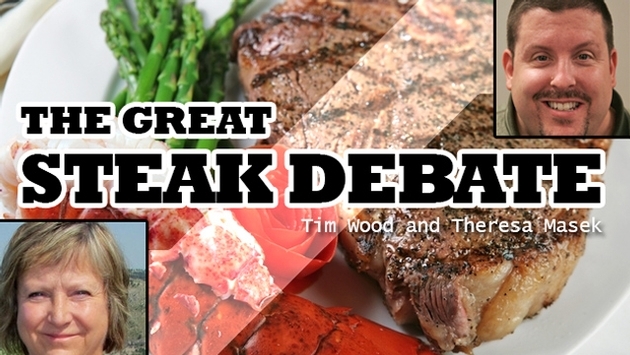 Our TravelPulse editors break down both sides of the Great Steak Debate. Many will see this move by Carnival as further erosion of the cruise industry’s meals-are-included message and an escalation of the dreaded nickel-and-diming syndrome found on many ships nowadays. Or they fear that the steaks regularly offered on main dining room menus will disappear and guests will have to pay for a good cut of beef. I say bring it on. The new Steakhouse Selections simply give cruisers another chance to enjoy a prime aged cut. It’s optional — no one is forcing anyone to spend the extra money. Because sometimes you want a really good steak and the always-available grilled flat-iron won’t cut it. But maybe you couldn’t get a reservation in the steakhouse specialty restaurant found on 13 Carnival ships. Perhaps the $35 service charge in the steakhouse is a little steep for you but $20 is more palatable. Maybe you’re cruising with kids and don’t want to subject them to the other diners who did pay the $35 in the steakhouse. Or maybe the $35 is fine for you, but you’re not spending that much on a meal that will be wasted on your 6-year-old. Or you like eating in the main dining room with your companions, and they don’t want to go to the steakhouse. Whatever the reason, the option to choose a really good steak in the main dining rooms is simply another choice. It’s there if you want it, skip it if you don’t. I can’t imagine that Carnival or any other cruise line would move to a la carte pricing or downgrade the food in the main dining rooms. In fact, you’ll recall that Carnival launched a major effort to improve the food in the main dining rooms starting late last year, making it less banquet-style and more of a restaurant experience. And if that includes $20 for a premium steak entrée, so be it. Make mine medium rare. Theresa makes great points here. Still, I can’t help but be overcooked about this news from Carnival. I just took my family on the renovated Carnival Freedom in June. We’re big fans of the cruise line. And indeed, the ability to have a premium steak in the main dining room while not having to take the kids to the onboard steakhouse is a big plus. Here’s my beef: Every move like this cracks the door open just slightly more for cruise lines to become like hotels and airlines with the fees-for-everything structure. As consumers, the biggest selling point for cruises – especially for middle-class families – is the bang for the buck and the fact that when it comes to food, there’s one bill. There’s a basic expectation of above-average decadence when you dine in the main dining room. I expect a higher grade of beef there than I’m getting at the buffet, and I don’t want to have to pay for it. My basic issue is the same I have with paying for extra bags on planes or for extra leg space so I’m not squished. Why? Why is that OK in this day and age? Why is it OK to have $4 gas and see oil executive take home billion-dollar bonuses while the average consumer is being squeezed out of having any disposable income? This is a very calculated move, a very tricky PR tightrope to walk. The economy is bouncing back, so it’s as good a time as any to push extra fees on the consumer. The sell centers around choice. I get that. I just fear that the more extras become the norm in parts of the cruise experience that always felt all-inclusive, the more we’re forced to accept choices mean more money. This won’t hurt the folks who can afford it. But for the folks saving years for cruises, these kinds of add-ons create the very class structure that middle-class vacationers never want to see on cruises. It’s part of what sold me on cruising in the first place. A simple line from an old friend. I know Royal Caribbean has been doing this for years. If anything, maybe it’s surprising that it took Carnival this long to follow suit. And yes, there’s always been a class structure. Some are in luxury suites, some have ocean views. Some have the money for big spa experiences and epic excursions. That’s all a la carte already. When you start messing with food on a cruise, you’re threatening the basic luxury that resonates most with the basic cruise fan. What’s next? Charge me extra for a burger at Guy’s Burger Joint? It’s very easy to see how tiers of choice on the high end will trickle down to added expense at every level. Pretty soon, the managed expense of a cruise vacation becomes the same add-on sticker shock we feel when we see the airline bill or the hotel bill. The line has to be drawn somewhere. I’m drawing my line in the filet mignon. Where do you stand on the Great Steak Debate? Let us know in the comments below, on Twitter or by emailing twood@travalliance.com.